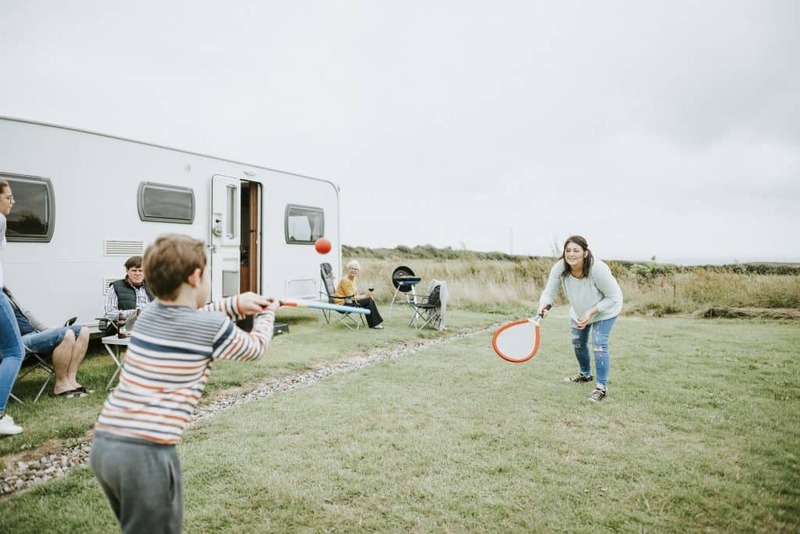 verybody has the dream of traveling around in an RV or travel trailer, but once the kids come along, that dream usually gets put on the back burner. Well, I’m here to tell you that’s not the case anymore. 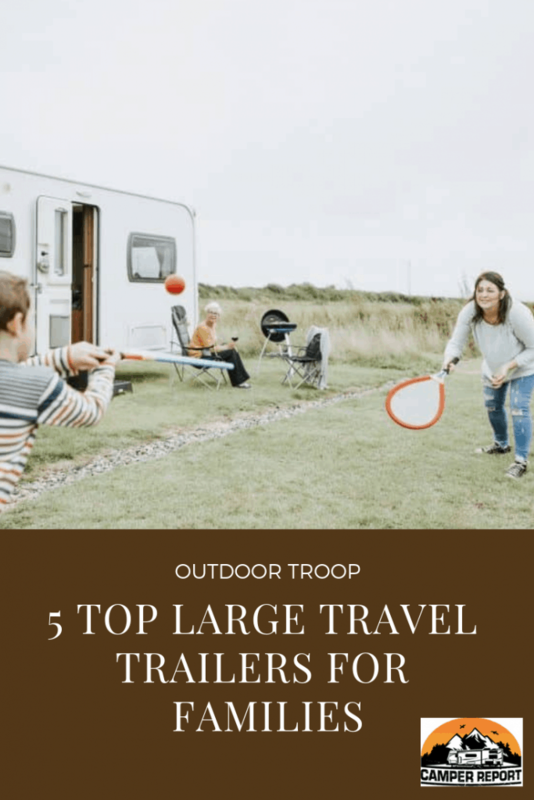 Here is a list of the top seven travel trailers big enough to comfortably fit a family up to six. 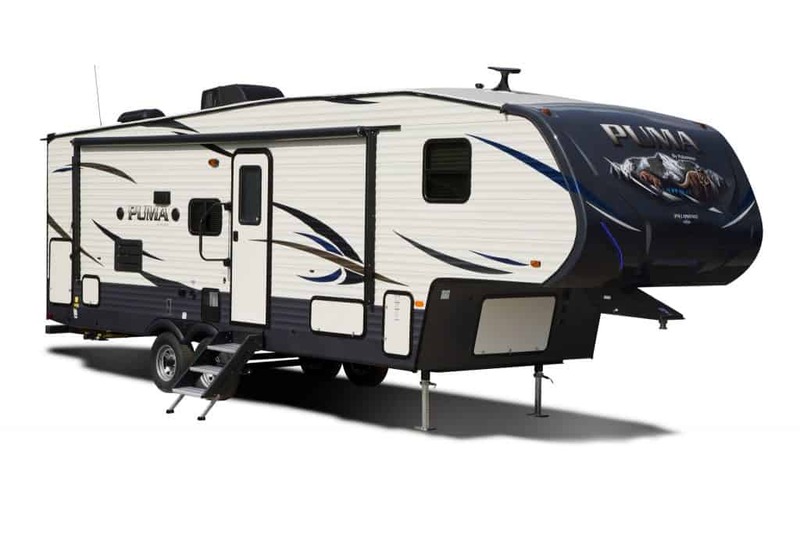 Puma is a pretty popular manufacturer of fifth wheels, campers, RV’s, and trailers. They are known for being pretty durable and spacious, especially when you pick a floor plan that is made big enough to sleep six people. Used, a Palomino Puma will cost an average of $20,000. You can find used RV’s and travel trailers on sites like rvtrader.com. The Palomino Puma has 43 different floor plans, sleeping between 4 and 10 people. Each one has plenty of storage, bunk beds, a furnace, and rubber roofs. Of course, a 12-year manufacturer’s warranty always helps sweeten the deal. Tinted safety windows and other necessary safety measures (i.e. smoke detectors, carbon monoxide, etc.) 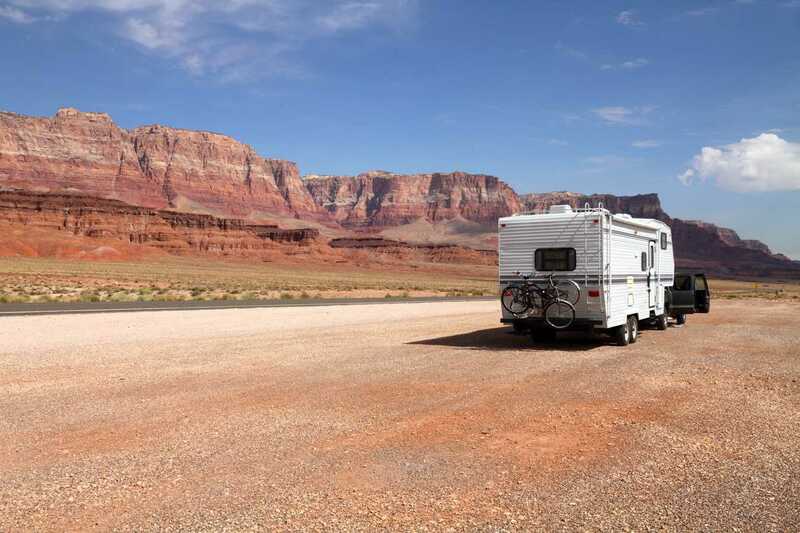 means that Palomino Puma travel trailers are safe for your entire family to travel in. Awnings and slide outs help increase the space your family can use, and many models come with extendable decks you can set up and put some chairs on when you park it. 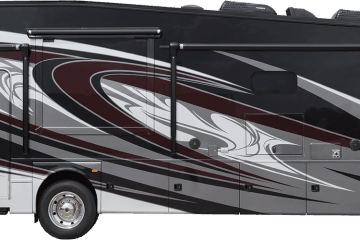 For this model, there is a u-shaped dinette, LED lighting, one set of bunk beds, a pass-through compartment, and a full size bathroom. Aspen Trail is another popular brand of travel trailers. They have a long history of making durable, lightweight trailers, RV’s, and campers. Dutchman travel trailers can weigh from as low as 3,125 pounds to 8,126 pounds. That weight is going to be a huge blessing to your poor towing vehicle that has to pull a trailer, a family, and a ton of gear. Used, a Dutchman Aspen Trail costs an average of $20,000. You can find trailers like the 2019 Dutchman Aspen Trail 2340BHS Travel Trailer for sale on sites like rvtrader.com. There are 36 different floor plans for the Dutchman, which sleep between 3 and 10 people. They have a fully walkable roof (meaning it’s all a single piece), a great sound system complete with outdoor speakers, a cable TV hookup, overhead cabinets, and tinted safety glass windows. In the 2019 Dutchman Aspen Trail 2340BHS Travel Trailer, you’ll find an additional outside kitchen, a full bathroom, double sized bunk beds, a u-shaped dinette, pass through storage underneath, and pass through storage. Table information provided courtesy of rvingplanet.com. Even though the 2015 Jayco Eagle Premier is an oldie, it’s a goodie, which is why it merits the list. It’s one of the bigger models, meaning it can sleep 10 people! On average, a 2015 Jayco Eagle Premier 375 BHFS Travel Trailer is going to cost around $45,000, so it costs about twice as much. It is much bigger though. 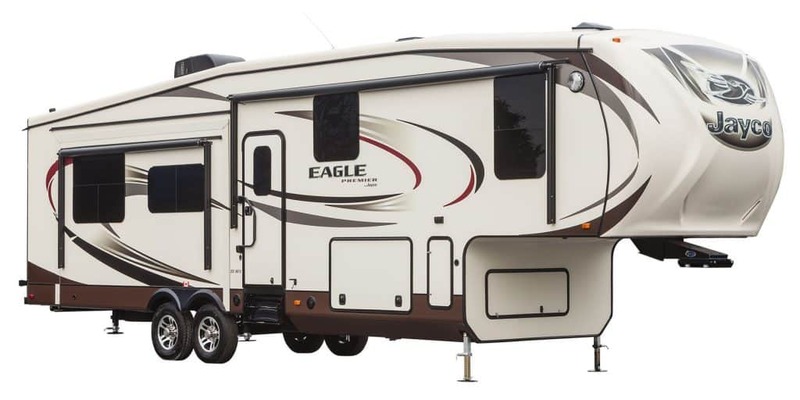 You can find used a 2015 Jayco Eagle Premier 375 BHFS on sites like rvtrader.com. The kitchen is one of the big selling points for the 2015 Jayco Eagle Premier 375 BHFS Travel Trailer. Namely, there are two of them, a full one in the main living area and a smaller kitchen outside. You can even fit a full sized refrigerator in the kitchen if you want. There are also two bathrooms, one half-bathroom and one full bathroom with a full-size shower. There is an upstairs, a washer and dryer, and a space heater that masquerades as a fire place. The storage underneath the trailer is enormous, and all of the interior cabinets are deep. Table information provided courtesy of rvusa.com. There are 44 floor plans you can choose from in a Keystone travel trailer, all of which can sleep from 2 people to 10 people. However, 33 of those floor plans can sleep six or more, so this is a good brand if you want a lot of choices. A used 2019 Keystone Hideout 272LHS Travel Trailer will cost an average of about $20,000. 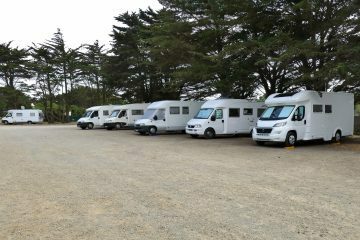 You can find these travel trailers for sale on websites like rvtrader.com. 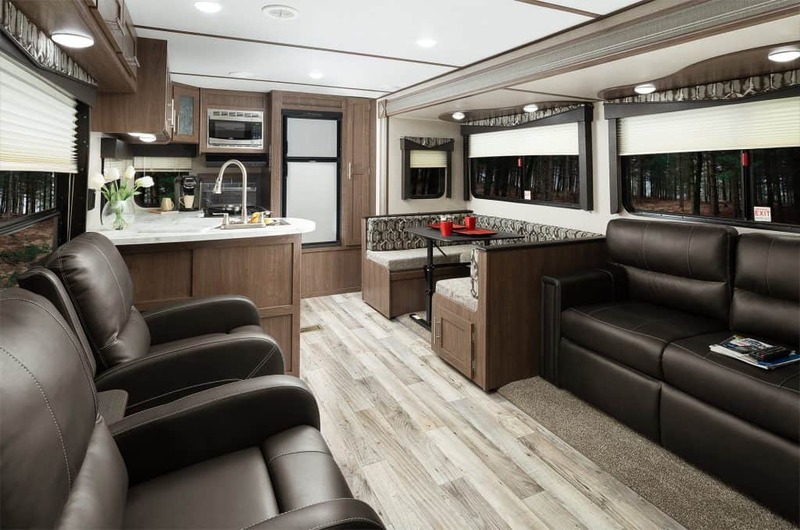 On the 2019 Keystone Hideout 272LHS Travel Trailer, you’ll find two entrance doors, a private bedroom, a surround sound speaker system, and a booth dinette. All Keystone Hideouts come with air conditioners, lighted awnings, stabilizer jacks, and a fully walkable roof. Keystone Passport travel trailers have 31 plans you can choose from that sleep between 4 and 10 people. There is a ton of deep storage space, both under and inside the travel trailer, which is going to be great if you are bringing your family along. A used 2018 Keystone Passport 3350BHWE Grand Touring Travel Trailer will cost you an average of around $23,000. You can find used RV’s and travel trailers like the 2018 Keystone Passport 3350BHWE Grand Touring Travel Trailer on sites like rvtrader.com. There is an air conditioner, a free standing dinette, gel-coated filon exterior walls, and gutters with extended downspouts available in each model. You can get a variety of upgrades with any model you buy as well. In the 2018 Keystone Passport 3350BHWE Grand Touring Travel Trailer model, you’ll find an exterior kitchen, an entertainment center, two bathrooms (a full bathroom and a half bathroom), a private bedroom, and a slide out bunkhouse. What Qualifies as a Travel Trailer? 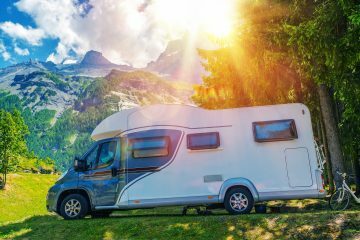 The simple distinction between a travel trailer and a motor home is that a trailer is pulled behind another vehicle, while a motor home is motorized and drivable. Travel trailers can be small and measure about 18 feet in length and wigh about 5,000 pounds. Mostly the small travel trailers are bought with small tourist adventures in mind. These fun sized travel caravans can typically be pulled behind a large car or small truck. You chould always make sure that you know the towing capacity of your vehicle. And always give yourself a 1,000 pound buffer, just in case. 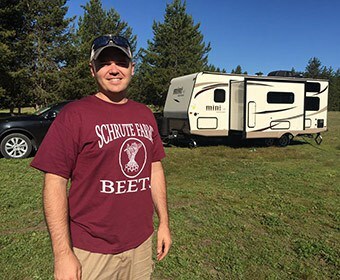 A larger travel trailer, like the ones in this article that can house a family, are typically purchased with larger journeys or full time living in mind. They will reach between 20 and 40 feet and can weigh up to 12,000 pounds. They wil typically have two axels as well. 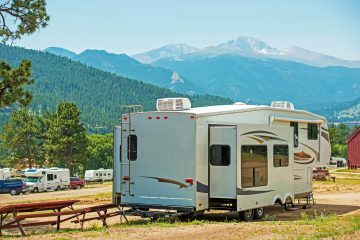 Because the large travel trailers weigh and measure so much more than the smaller trailers, they nee to be attached to the towing vehicle differently. Small trailers can be hitched up with a normal ball hitch on the back of the towing vehicle. The larger trailers, however, have a sort of “goose neck” that fits into the bed of the truck towing it, and anchors down that way. The “goose neck” hitch helps the trailer not swerve on the road, and provides better stability and ease in towing. When you are RVing with your family, you are going to have to think about RVing a little differently. You might be able to travel light and only wear the same two pairs of pants, but your children might want more clothing. And then there’s the bathroom supplies to worry about with six times the people. When looking for a travel trailer that you can use to travel with your family, you need to be looking for a few things on the trailer. First thing’s first, you’re going to want a lot of storage space. And I mean a lot. Look for travel trailers with deep cabinets, long draweres, pass through “basements,” and a lot of pantry space. You can look up some RV storage hacks. The most helpful will include putting everything on hooks, getting stuff up off of the ground, making use of shoe organizers, and getting creative with magnets. With a family you are probably going to want two bathrooms. A lot of large travel trailers have a half bathroom and a full bathroom. The full bathroom will include a shower, which is very important if you are going to be in the travel trailer full time. A lot of people means a lot of dirty clothes. 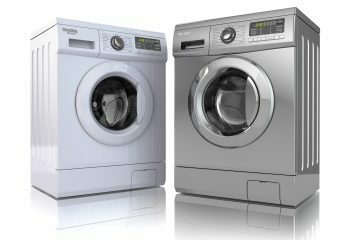 Try and find a travel trailer that comes with a washing machine and a dryer. You are going to be thanking yourself when you don’t have to keep paying buckets of quarters every time you need to do a load of laundry at a camp ground. Get a travel trailer with the biggest fridge as possible. Some travel trailers are so big, that you can actually install a full size fridge. I would recommend against that however. With RV refigerators, they run off of propane, which will work even when you are not hooked up to a generator and will stay cool even when you’re driving. Last, but not least, make sure to get a traveling trailer that fits everybody. You want to have enough sleeping space. A lot of sleeping spaces will end up being couches, trundles, and folding down tables. There is often a bunkhouse in many traveling trailers. A bunkhouse is a sleeping area that is created by two slide outs you can extend when you park the traveling trailer. Sometimes, there are also private rooms in a lot of traveling trailers, usually made for the parents. What are the different classes of RV’s? Class A- basically a bus that you can live in. It is motorized and usually around 40 feet long. Class B- a big van that you can live in with a small kitchenette, a bed, a toilet, and a sitting area. Also motorized. Class C- a larger version of a Class B. It looks like a tuck and a mounted camper got welded together. The overhang includes a bed. Also motorized. Travel Trailer- can be hard sided or pop up trailers and are pulled behind a towing vehicle. They range a lot in price and size. The kind of travel trailer you get is going to depend on the kind of adventure you are aiming to have.